This was my 5th visit to the adult playland in the desert. Even so each time I visit I find new things to do, eat and places to see. First, let’s start with how to get around and avoid drinking and driving. Get ready to do lots of walking. The main hotel strip from one end to the other takes a good hour and half to walk on foot. There are plenty of taxi’s and Uber’s available in the area but the constant traffic congestion on the Las Vegas Boulevard makes the drive long and inconvenient. If you are arriving from the airport, you have plenty of choices for getting to the strip and/or your hotel. You could take a taxi, call an Uber/Lyft, or use the local airport shuttle. Depending on how close your hotel is to the airport will depend on which method is most cost effective. You will want to take into account the time it will take too. If you have the time and patience to wait for the shuttle, and your hotel is on the Northern end of the strip then it might make sense. Keep in mind there will be several passengers all going to different hotels and the shuttle will stop at each one along the way, making it take a bit longer. If your hotel is on the South end, closer to McCarran Airport, then it would be a shorter trip and might make more sense to take a quick taxi. You can download the RTC Transit App to get the latest routes and schedules. It is open Monday 7AM - midnight; Tuesday - Thursday 7AM - 2AM; Friday - Sunday 7AM - 3AM. Rates for the monorail begin from $12 for an unlimited one-day pass per person. You can buy passes online or at the stations. 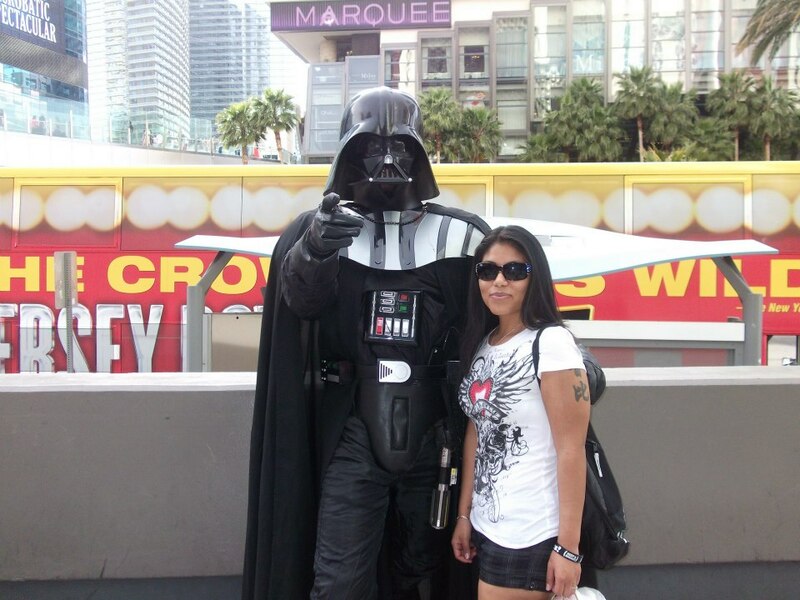 Walking around the The Strip...Is he my father? Mirage - Treasure Island Tram runs between 7AM - 2AM daily. It arrives about every 15 minutes and lasts about two to four minutes. Bellagio - Citycenter - Monte Carlo Tram runs between 8AM - 4AM daily. It arrives about every 15 minutes and lasts about two to six minutes. Mandalay Bay - Excalibur Tram runs daily from 9AM to 10:30PM daily. The times vary depending on which hotel you start from. Most are probably familiar with the dazzling night time lights of the Vegas strip. Sin City has been featured in so many movies from the classic Viva Las Vegas (1964), Scorsese’s Casino (1995) to the slapstick comedies like The Hangover (2009). They highlight the grand hotels, booze, strippers and everything that is associated with the “bad boys” of Vegas. Below are some of the iconic sites around the city. Let’s start with some of the well known glitz and glamour. I’ve personally seen the short but fantastic Fountain show close to 10 times and I’m still always fascinated. You must really see them in person to get the full effect. The fountains are choreographed along to music that include opera, classical, Broadway and pop tunes. I prefer to see them at night when you can really see all the lights at their brightest. My personal favorite free attraction is the explosive show in front of The Mirage. If you stand close enough you can really feel the heat. There are booming explosions, fireballs and a thundering soundtrack. There was a recent redesign and it’s now better than ever. The fire shoots more than 12 feet into the air. This is an experience alright. This strip referred to as “Fremont” is in Downtown Las Vegas. It’s the original part of the city where the first few old school gangster style casinos started. It has a different vibe from the glitzy main strip. For this reason and a few others, this is probably my favorite part of the city to visit. Go at night to see the light show and all the street performers. You will likely see some musicians drumming on upside down paint tubes or playing violin. There might be some break dancing to hip hop jams. And there are usually a few artists showing off their skills with spray paint. It’s likely that at least two stages with live bands are playing all night. One year I went around St. Patrick’s Day and they had an Irish rock band playing with bagpipes. How about doing something heart pounding like ziplining above the crowd? Fremont has The SlotZilla zip line with two options: lower “Zipline” at 77 feet and upper “Zoomline” at 114 feet. How about shooting a few zombies? A new attraction now open is Fear the Walking Dead Survival that is part haunted house, part escape room, part interactive video game and motion thrill ride. The giant M&M's World Store next to the MGM Grand is one of five in the world. It has four floors filled will all things M&Ms. You can even personalize your order with any phrase or name you want. They have a free 3-D Movie, "I lost my 'M' in Vegas". You can choose to mix and match colors and flavors. I highly recommend trying the Birthday Cake flavor! You mustn't leave Vegas without catching at least one show. There are so many to choose from but one iconic show that is always a hit is "The Blue Man Group". One show I have been meaning to see for the longest is Cirque du soleil: Zumanity. I've heard nothing but rave reviews. You can purchase tickets ahead of time or once you arrive in Vegas. The city is a food mecca, probably best known for the classic All-You-Can-Eat Vegas buffet. I’ve experienced a couple myself, let me tell you, they are no ordinary buffets. The variety of food is abundant. One can find every sort of cuisine. The food is always surprisingly fresh. And of course, it’s Vegas so guess what most of them also have included...yup endless booze. So you partied all night, gambled for a bit, drank til you can’t remember, it’s late morning and you’re probably famished. Where to go for a great brunch? 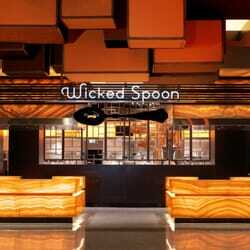 Wicked Spoon at the Cosmopolitan. Expect a long wait in the line for a spot because everyone raves about this spot. Why not, when there is the option to have the Bottomless Beverage package for an additional $15 that includes mimosas, champagne, Bloody Mary's, house red or white wine, or draft beer. Be wary that it does have a 2-hour limit. Located on the 2nd Level of The Cosmo. Not surprisingly, Vegas knows you should be able to get food practically anywhere and anytime. The best food court is inside The Venetian Hotel. You will find options such as coffee, pastries, light fare, burgers, paninis, salads, gelato, soups, sandwiches, pizza and more. One of my trips to Vegas, my travel buddy had a sudden urge to try some Dim Sum. We went to a place called Chang’s near The Tropicana. It was absolutely delicious. And very affordable compared to lots of fancy places in the city. It doesn’t hurt to take a tip from a local for some good grub. Our Uber driver suggested a small but delicious restaurant off the strip called Delhi Indian Cuisine located in Mission Center on the corner of Maryland Pkwy and E. Flamingo Rd. It was voted "Best of Las Vegas in 2015". I love spicy and their curry delivered that super kick I was craving. The garlic naan was tasty too. They have a daily lunch buffet from 11AM to 3PM. If I had to pick a cuisine, I’d say my favorite food of all time is pizza. I am partial to thin crust New York style pizza with lots and lots of sauce. Imagine my excitement when a friend of mine told me about a “Secret” pizza place inside The Cosmo. I first heard about it around 3 years ago on my second trip to the Sin City. I was on a mission to find it. There is no sign posted for it. It is truly hidden, not advertised in any fashion that I know of. Simply word of mouth. We searched and finally found it in a corridor on the 3rd floor of the hotel. I won’t spoil the secret and give you exact directions. Finding it is part of the fun. But it was worth it. It’s not a true sit down restaurant, more like something you would find on a corner of New York with a few counter tops to stand and eat your slice of pie. You can choose a slice or an entire pizza, and trust me they are huge. They are made fresh to order and since it took a while before ours was ready, when it finally came out we were starving. I should mention we had previously finished off a few mimosas prior to this. The slices were thin, gooey with melted cheese, and dripping in freshly made pizza sauce. It did not disappoint. Where you chose to lay your head in Sin City probably depends on what you hope to accomplish for your stay. Do you want something quiet? Do you want to party all night long? Do you want to be pampered? How about budgeting and saving the cash for booze and the slots? You can find any and all of the above. I was in the party mood the first few visits to Vegas so I chose to stay at The Hard Rock Hotel & Casino which is just off the strip. The resort with the abundance of pools, one with real sand, are what sold me. The tattoo studio inside the hotel was convenient. Their iconic diner called Mr. Lucky’s had some of the best french toast of my life! Have you been to Vegas yet? Where are your favorite spots?